Ultra Dragonoid Typhoon is a variation of Dragonoid. It has multiple wings enabling it to fly with greater speed and maneuverability. It can shoot multiple fireballs to overwhelm its foes. 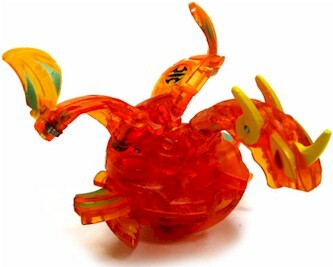 The highest G-Power of this Bakugan is 700 Gs in Subterra and it also has 670g in Ventus. It is in the Special Attack series. Its special attack feature is spinning. There are two black dots on its back that must be lined up to lock it in place so it can spin or close. Purchase your Ultra Dragonoid Typhoon from Amazon now!